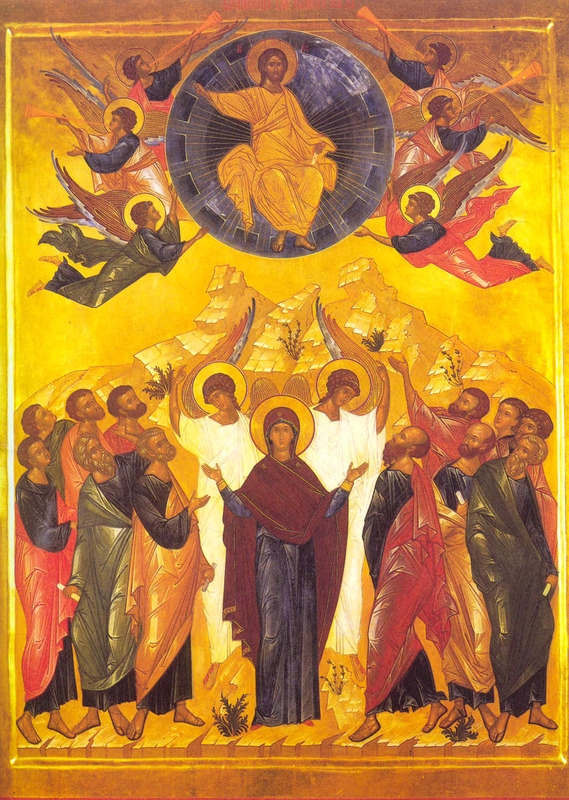 "And while he was blessing them, he departed and started to ascend to heaven" (Luke 24:51). How did this utterly unfamiliar and unique event of the Ascension of Christ occur? They had already arrived at the middle peak of the Mount. The city of Jerusalem stretched in front of them. The hole where the Cross had stood was still open. So was also the entrance to the Grave of the Savior, since the great stone that had been used to seal it was still lying on the ground. And then, the Savior turns his back to the ungrateful city of Jerusalem and his glance looks to the East, as David joyfully sings in one of his psalms: “Sing to the Lord who is going up to the heaven of the heaven towards the East” (Psalm 67:34). And as he takes leave of his Disciples he raises his immaculate hands and blesses them for the last time – those hands with which he recreated the man whom he created at the beginning, and which he stretched on the cross out of love for humanity and united those that had been severed, i.e. those which had been diversified. Just as the eyes of the disciples could not be satisfied enough in seeing the divine and mellifluent face of their Lord, suddenly he began to ascend into heaven. Their glance remained nailed, as it were, on that paradoxical and inexplicable display of the bodily Ascension of the Lord, until he was concealed by the luminous cloud. Belega pentraaĵo kaj ankon pro tre interesta klarigo .La lasta artikolo kiel bonega konkludo aŭ sumo de ĉio menciita supren ,tre plaĉas al mi . Thank you for sharing the meaning of Christ's Ascension! There is a very good reason why no other man has had the impact on this world like Jesus Christ, the Son of God. By His Grace we are saved!